Trigger fingers are one of the most common conditions seen among hand surgeons. I personally see several patients with a trigger finger every day in my office. The focus of this blog is to answer some of the most common questions patients ask me. A trigger finger is essentially a swollen tendon along the palm side of the finger that causes pain and prevents the finger from bending and straightening smoothly and normally. The tendons that bend, or flex, the fingers pass through a tunnel made of little loops of tissue called pulleys. This is like a belt passing through belt loops on a pair of pants. When the tendon is swollen (like a belt having a knot in it), it does not pass smoothly through the loops. In an early trigger finger, there may be just pain along the finger, or subtle “clicking” when the finger is bent. In more advanced trigger finger, the finger can become stuck, or “locked” in a bent or straightened position. Sometimes the other hand will be required to pry the finger straight again. This can be quite painful. What is the cause of a trigger finger? The answer to this question is usually: “we don’t know”. Sometimes a trigger finger will develop after an injury. This could be a stretch injury to a finger, such as a dog pulling a leash. Sometimes they develop after a period of overuse, such as excessive needlework or quilting. While trigger fingers are more common in people with diabetes, most often the cause is simply “bad luck”. No. Trigger fingers can almost always be fully treated and the finger will likely return to normal – but it may take time. This is good news, as there are many problems in the hand, such as arthritis or nerve damage, that cannot be fully reversed. Once gone, a trigger finger usually leaves no trace that is was ever there. How do you treat trigger finger? Placing CoBan tape, or a Band-Aid around the joint creases can limit flexion and decrease triggering, which can allow tendon swelling to subside. Trigger finger can be treated with simple things, such as rest and avoiding activities that irritate the finger or cause the triggering. Sometimes a splint may be used to hold the finger straight, particularly at nighttime. 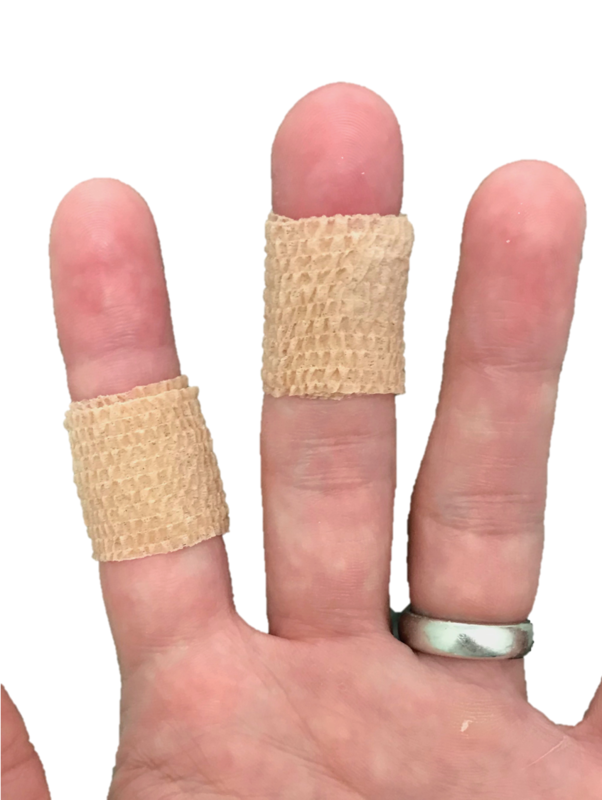 Alternatively, CoBan tape or a Band-Aid may be placed along the backside of the finger to limit bending and the painful catching. Anti-inflammatories may be helpful to shrink down the swollen tendon. These can be oral (such as ibuprofen or naproxen), topical gels, or injected. A steroid injection is the most powerful way of getting rid of the pain and triggering. Each injection has an approximately 60% chance of curing the trigger finger, so sometimes it may take more than one attempt, usually spaced out by ~6 weeks. If all else fails, a small surgery can be performed. This takes approximately 10 minutes, and is done through a small ~1 centimeter incision in the palm. Underneath the skin, the small band of tissue that is “catching”, “snagging” or “locking” the tendon is released. This is highly effective, and eliminates the triggering immediately nearly 100% of the time. What happens if a trigger finger is not treated? Occasionally, the size mismatch between the swollen tendon and the tight tunnel can prevent any motion and cause the finger to become “locked”. This is like trying to pass a belt buckle through the belt loops on your pants. In a locked trigger finger, the finger will no longer bend or straighten. Once this stage is reached, surgery is usually needed and is recommended to restore motion. Newer Post"Can using a computer cause carpal tunnel syndrome?"